Peter Makuck grew up in New London, CT. He took courses at l’Université Laval in Quebec and received his B.A. from St. Francis College in Maine where he studied French and English. After a two-year stint of teaching French, he returned to graduate school and took a Ph.D. in American literature from Kent State University. In 1974-75 he was a Fulbright Exchange Professor at Université de Savoie, in Chambéry, France. In 1990-1991 he was Visiting Writer at Brigham Young University. Until 2006 he edited Tar River Poetry, a national journal that he founded in 1978. 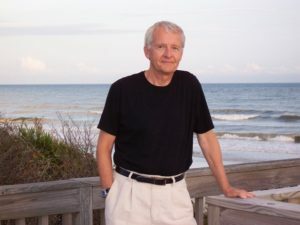 Distinguished Professor Emeritus at East Carolina University, he lives with his wife Phyllis on Bogue Banks, one of North Carolina’s barrier islands. His collection of short stories, Costly Habits, released by University of Missouri Press in October 2002, was nominated for the Pen/Faulkner Award. The University of Illinois Press published Breaking and Entering, an earlier collection. He has five times received honorable mention in Best American Short Stories. One of his stories, “Filling The Igloo,” was included in The Best of the Southern Review. “The Trouble With Smitty,” a personal essay on guns, was listed in The Best Essays of 2000. His “Trapping in Foreign Country” won the Monroe Spears Award, given for the best essay to appear in The Sewanee Review in 2010. The other half of Makuck’s writing life is given to poetry. Where We Live (1982), The Sunken Lightship (1990), Against Distance (1998), and Off-Season in the Promised Land (2005) were published by BOA Editions Ltd. Pilgrims (Ampersand Press) won the Zoe Kincaid Brockman Award for the best book of poems by a North Carolinian in 1989. Shorelines, a chapbook, was published in May 1995 by GreenTower Press. More recently, in 2009, Independent Press released another chapbook, Back Roads. Released in 2010 by BOA Editions, Ltd., Long Lens: New & Selected Poems was nominated for a Pulitzer Prize. Makuck’s essays and reviews, stories and poems have appeared in Poetry, The Hudson Review, The Yale Review, The Nation, North American Review, The Southern Review, The Georgia Review, The American Scholar, The Gettysburg Review, The Sewanee Review, and The Virginia Quarterly Review. A reviewer for The Hudson Review, he has also contributed to the Raleigh News & Observer, North Carolina’s largest daily newspaper. In 1993, Makuck received the Charity Randall Citation (a cash award and bronze plaque), awarded annually by the International Poetry Forum in Pittsburgh. He has been a lecturer/discussion leader in the “Poets in Person” series sponsored by the National Endowment for the Humanities.